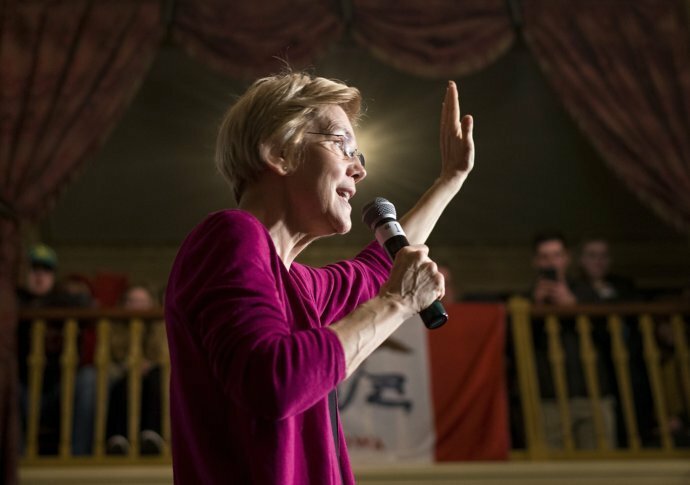 DES MOINES, Iowa (AP) — Massachusetts Sen. Elizabeth Warren is introducing herself to influential Iowa Democrats by telling her personal story of economic opportunity, trying to lay claim in the emerging 2020 presidential field as a champion for a middle class she says is withering under President Donald Trump. On her first full day as a Democratic presidential prospect in the kickoff caucus state, Warren repeatedly argued that opportunities like hers have vanished because wealthy interests have bent policy makers in Washington to their will. A leading Democrat in the Senate, Warren has made a name for herself as an advocate for consumer protection and become a regular target of Trump. But by the end of a day of public speeches and private meetings during her Iowa debut, Warren made clear her campaign will be built upon the twin themes of economic fairness and government stripped of money’s influence. It’s a message that echoed with an audience in the working-class cities of Council Bluffs on Friday evening and Sioux City on Saturday morning and lit up the crowd in the liberal state capital of Des Moines Saturday evening. Warren was scheduled to close out her Iowa visit Sunday by meeting privately with Democratic activists at a Des Moines coffee shop and later with a public roundtable discussion with women in a Des Moines suburb. Warren strayed little from the fairness and anti-corruption themes throughout the day. Even when Sioux City Democrat Tricia Currans-Sheehan asked her why she submitted to a DNA test after Trump questioned Warren’s claim of Native American ancestry, Warren shifted back to economic fairness. The test results suggested Warren could have had a Native American ancestor many generations ago, which she described as the difference between ancestry and having a connection to a tribe, something Warren says she never claimed. Similarly, Warren refused to comment Friday on Michigan Rep. Rashida Tlaib’s profane call to impeach Trump. Warren instead urged Congress to act to protect the special counsel Robert Mueller’s investigation. She didn’t hesitate, however, to allude to potential rivals Tom Steyer and Michael Bloomberg, both billionaires, by arguing for elections free from the influence of billionaires. “None of us believe that billionaires ought to be able to self-fund” their campaigns, she said. Steyer is scheduled to visit Iowa Wednesday. Though Warren announced the formation of a presidential exploratory committee Monday, the weekend events had all the trappings of a full-blown campaign. Warren’s staff logged the names and contact information for those interested in more information. Warren herself said, “I want to run a grassroots campaign,” and urged attendees to volunteer and contribute money in small amounts. She unveiled a raft of staff hires last week. And joining her in Iowa was Joe Rospars, a recent Warren hire who was Barack Obama’s digital strategist during his successful 2008 and 2012 campaigns. Warren’s visit is an effort to gain an early advantage in the state. Other Democratic presidential prospects are expected to announce their plans in the coming weeks, and have been in touch for weeks with party leaders, activists and potential staff in Iowa.